Just in case you needed another reason to cry the day of Donald Trump’s inauguration, last night the Sundance Film Festival debuted the sequel to An Inconvenient Truth, ten years and a bunch of terrible natural disasters after the original, Oscar-winning documentary about former Vice-President Al Gore’s dogged fight to sound the warning call on global warming. That first film, directed by Davis Guggenheim, was essentially an expanded version of a wonkish and highly persuasive slide show, on the environmental crisis, that Gore had been giving around the world. This new film, An Inconvenient Sequel: Truth to Power, directed by Bonni Cohen and Jon Shenk (Guggenheim is still a producer), plays less like a horror show and more like a tragedy, given that many of Gore’s predictions from the first film, including his much-derided claim that ocean levels could rise to flood the World Trade Center site in New York City, have come true. And there at the center is Gore, our indefatigable grandfatherly hero, now with white hair and a bit of a paunch, but with the focused determination of a man who’s found his life’s purpose. He’s still giving that slide show, updated daily with some new pieces of evidence on how we’re doomed, but now he’s also hopping around the globe building an army of slide-show-giving acolytes through his Climate Leadership Training Corps, while personally negotiating deals with world leaders, all in the face of rapidly rising global temperatures. The film was impossible to watch without feeling immense sadness for how much ground the fight has lost without Gore in a position to enact policy. And how much more ground might still be lost, given that the new climate-change-denying president has nominated climate-change-denier Scott Pruitt to head the EPA. Gore’s moment with the Supreme Court, and its effect of making him a private citizen, gets plenty of play in the film, often by Gore and often for laughs (that just as quickly become tears when you remember what happened next). There’s the story Gore tells about how a woman in a diner did a double take walking by him and told him that if he dyed his hair black he’d look just like Al Gore. And the time we see a Chinese guy recognize Gore while riding the Paris Metro, and ask one of Gore’s aides if he’s still the president. 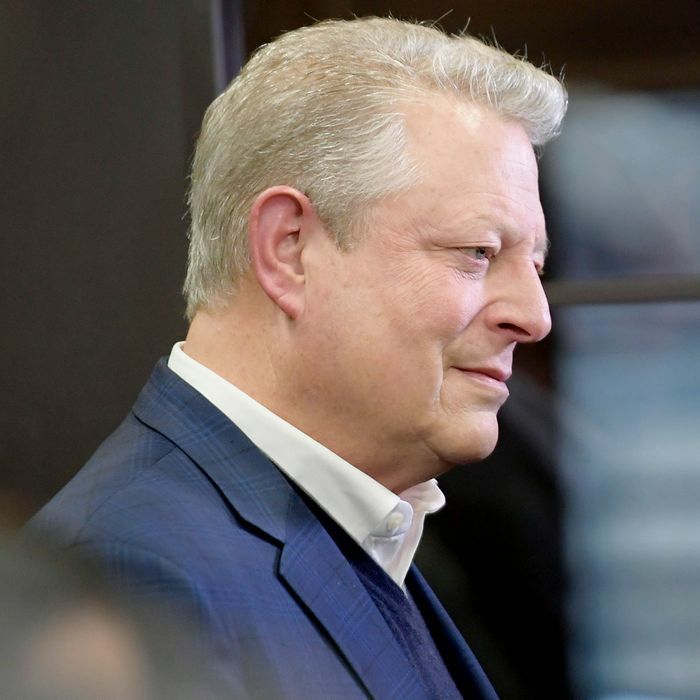 Gore describes himself as “a recovering politician” who’s constantly battling relapse, but watching the film, you wish he’d get back in the game. He looks older, but he sounds younger, removed from the pressure of winning, with an unflinching, fiery brand of rhetoric that often moved the Sundance audience to cheers. You never lose the sense that his message is urgent. Gore gets so worked up talking about how politicians are twiddling their thumbs while rising temperatures allowed Zika-bearing mosquitoes to enter the United States and put pregnant women at risk that he has to apologize to the crowd. In another moment in the film, we watch as he gets on the phone with the world’s leading manufacturer of solar panels and convinces them to give India a deal sweet enough to get the country to stop building coal plants and sign October’s Paris Accord. Get that man a mint julep! It helps that he’s right, and has the force of having been right for 25 years. Now, instead of just saying the world is getting warmer, he can present the evidence that 14 of the 15 hottest years ever measured have been since 2000, with 2016 the hottest of all. We can see him having intense debates with Indian politicians who want to know why they’re being asked to give up using coal when the United States got to pollute without restrictions for 150 years. He can show footage of Greenland’s ice fields exploding in the heat, and of vulnerable cities like Miami futilely building higher streets to combat the rising ocean, and of people in India getting their shoes caught in melting roads in 123.8-degree heat. Heat makes the oceans evaporate faster, which causes bigger storms, which cause bigger floods. It also dries out farmland and causes longer droughts, which cause fires. “Every night on the news is like a nature hike through the Book of Revelations,” says Gore, but this time around he’s not just trying to drive home the message of “we must do this for our children”; he’s showing the human cost of inaction. The vast field of wooden crosses in the Philippines marking just some of 6,300 who died in 2013’s Typhoon Haiyan. The mass graves that Pakistan was digging in preparation for its next heat waves. The dots we can and should be connecting between the horrific, history-defying drought that displaced as many as 1.5 million Syrian farmers and the unlivable conditions in crowded cities that played a huge part in causing civil war. There is a cause and effect between the destabilizing effects of climate change and rise of terrorism — a point Gore is trying to make on air in Paris when he gets news that across town gunmen have walked into the Bataclan nightclub and started shooting. His message to the crowd at Sundance was surprisingly one of hope, regardless of who was set to move into the Oval Office the next day. “We’re going to win this,” said Gore; the only question was how fast. “The reality has been that the maximum that’s politically feasible has fallen short of the minimum the scientists tell us is necessary to save the planet balance, according to what the laws of physics dictate,” he said. We could despair, which would be another form of denial, or we could try to change the limits of what is politically possible. And to that end, he promised that when new distributor Paramount releases the movie in theaters, on July 28, they’d be releasing a book with a DVD the same day, and in one way or another be giving every audience member a means to learn how to give their own ten-minute slide-show presentations in their own communities.